It is important to Teach your children that electrical appliances, cords, switches and outlets are not toys. Safety shuttered outlets as well as plastic covers for ordinary type outlets are available. Electric blankets are not recommended for use by babies or young children, who may wet the bed. Immediately Switch off all heating appliances if the power fails – fires have been caused when the power returns unexpectedly. Combustible material must be kept well clear of all heating appliances. Any tingle or slight shock from an electrical appliance should be regarded as a warning. Advise your electricity authority or a registered electrical contractor immediately. Always disconnect the appliance from the power source before touching the appliance, and label it clearly to prevent anyone else from using it until it has been repaired and tested or replace it completely. Some electrical articles purchased overseas may not operate satisfactorily under Australian conditions and may not comply with our safety standards – such articles could be hazardous if used without modification. If you purchase electrical articles from overseas, have them checked first before you use them. Make sure they carry a compliance mark issued in Australia. Even if you consider yourself to be handy around the home, DO NOT attempt electrical work of any kind. ALWAYS get it done by a registered electrical contractor – knowledge and experience of that person is your best protection. 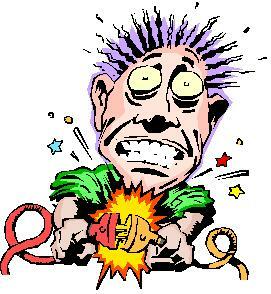 When someone receives an electric shock, the person is electrified until released. Take precautions to prevent receiving a shock yourself by immediately switching off the electricity where practical. The person must be pulled or pushed clear of hazard using dry non-conducting material such as wood, rope, clothing, rubber or plastic. DO NOT use metal or anything moist. Where necessary, prevent the person from sustaining further injury by falling. Send for an ambulance or a doctor immediately. The first 3 minutes are vital – act immediately to assess their level of consciousness and then, if person is not breathing, commence resuscitation.